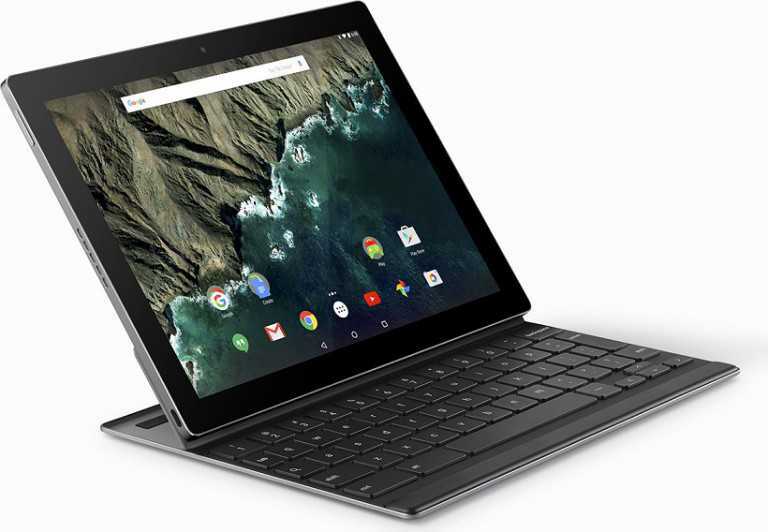 The Pixel C is the latest addition to Google’s Pixel range, which also features the very popular Chromebook Pixel. The largely-unexpected Android tablet, which appears to have its sight set on Microsoft Surface slates, features a convertible design, stunning display and robust NVIDIA processor. Google Pixel C features similar look as the Chromebook Pixel with a solid body made of aluminium. It has a silver finish and rather sharp edges. On the rear is a Pixel logo painted with Google’s traditional colours of yellow, red, green and blue. The tablet, which is the first Android slate to be built in-house by Google, crams in a massive 10.2-inch display with an impressive resolution of 2560 x 1800 pixels for a pixel density of about 308 pixels per inch. You can use the Google Pixel C in a laptop mode by attaching an optional full-size keyboard, which you will have to purchase separately. Attachment of the keyboard to the slate is achieved with the aid of strong magnets, which are built-in to the keyboard. The magnets are so strong that they allow you use the Google Pixel C as you would a laptop without any fear of the keyboard coming off. The magnetic hinge rotates up to 180 degrees and allows the tablet to be kept at any angle in the range. Google Pixel C is designed for more productivity and is expected to compete with the likes of Surface Pro 3 and the iPad Pro . Google Pixel C is engineered for very impressive performance with the latest Tegra X1 processor from the stable of NVIDIA. With support provided by a 256-core Maxwell GPU and 3 GB of RAM, the chip should deliver very solid performance, especially for gaming purposes. The slate runs on the latest Android 6.0 (Marshmallow) operating system – a break from the Chrome OS that powered earlier Pixel devices. What this means is that you will have to be content with running only apps designed for Android devices, even when using the Pixel C in laptop mode. The tablet features four front-facing microphones for Google voice commands. Like the Chromebook Pixel, it has a USB Type-C port for charging. Google Pixel C will be available in 32GB and 64GB models. Google Pixel C comes at a price of $500 (100,000 Naira) for the 32GB model and $600 (120,000 Naira) for the 64GB model. This price is for the tablet alone. If you need the magnetic keyboard you will need an additional $149 (30,000 Naira).